It can sometimes be a little bit confusing how Logic Pro organises its folders and how we should work with them. I’m going to demystify some of this in the following article. This folder contains organised subfolders of .exs files representing the instruments you see in the menus of the EXS24 mkII Sampler when you open it up in Logic Pro. n.b. The EXS files refer to the audio files (or samples). Together, these comprise the EXS “instrument”. Here you will find the samples referred to by the EXS files. Logic Pro’s instruments and effects plug-ins come equipped with a numerous presets as “.pst” files. This is where they’re stored. When you’re using a Logic Pro plug-in (including instruments) and tweak a setting, for example “Predelay” on a reverb, then go to save the setting, Logic Pro doesn’t offer you to save the setting in the same folder it was loaded from (the Factory location). Instead it offers you the equivalent location in the User level config folder. You could, if you wanted to be contrary, navigate to the factory location and try to overwrite the original preset there. Logic Pro will let you do this – they’re not read-only, but you wouldn’t want to do it. If you do perform such a save, incidentally, Logic Pro does not thereafter operate with the factory folder by default: the next time you try to save, it’ll point you to the User folder again, which is where you should be. Once you have saved a preset here it will be visible in that plug-in’s menu to be loaded again. You can define subfolders on the file system and these will be reflected in the menu. Logic Pro should offer you this location when you wish to save instruments from the EXS24 mkII Sampler Options → Save instrument as… menu. If it doesn’t, then navigate to here. Instruments saved here will then show up in the EXS24 mkII menu reflecting the folder structure you have defined. Factory instruments are moved from the root into their own “Factory” submenu, as you can see in the picture. As we might expect, the “EXS Factory Samples” folder is not present in the User level config folder. You store the actual samples for your instruments wherever you like – perhaps in a location from which several unrelated applications can easily load them. I store mine at /Users/Gavin/Music/Sample Libraries. This is a system folder, as it were, and in here you will find a folder called “Apple Loops” where Logic Pro has installed all of its audio loops. They are actually inside the subfolder Audio/Apple Loops/Apple. Also inside the Apple Loops folder (along with the “Apple” folder) is one called User Loops where shared user loops can go. But as we’ll see in a moment, you will more likely put your own loops somewhere else. This is where Logic Pro, by default, puts any plug-ins that you have installed using their installer programs. They’re placed here so that they will be available for any user. You’ll find appropriate folders for Audio Unit plug-ins (“Components”) and other formats which might have been installed even though you probably won’t use them on OSX. You shouldn’t usually edit these system folders directly, but use proper plug-in uninstallers if they’re available. All of your third-party plug-ins have been given folders in here, inside which you will probably find any factory presets (that is, presets that shipped with the plugin). Note that there may not be any presets in here if the plugin just doesn’t have any or if the manufacturer has instead decided to place them in another custom location (possibly the /Library/Application Support folder). You’ll find the equivalent of the Global Audio folder inside your own Library folder (access to this is restricted – go to the Finder “Go” menu, hold down “alt” and it will appear). You store loops you have made in the Apple Loops/User Loops/SingleFiles folder in here (they are actually put in this folder if you drag them onto the Apple Loops Browser within Logic Pro). n.b. Aliases within the SingleFiles folder are not followed by Logic Pro. If you have purchased third-party Apple Loops then these should go, in their folders, inside the User Loops folder. 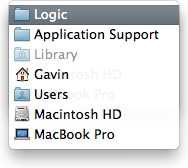 They will then show up under “Other” in the Logic Pro Loops Browser. Another option (one I recommend) is to move these libraries to a central location, as suggested earlier, and instead place aliases to the folders in the User Loops folder. They will appear just the same. This folder should contain all of the same subfolders as its global equivalent. When you have a plug-in window open in Logic Pro with an instrument inside it and you go to save the state of the plug-in, you’ll be offered the appropriate location here and Logic Pro will save a .aupreset file. When you save the state of an instrument using its own menus rather than those of the Logic Pro plug-in window, the preset may well be saved in a different location and using a proprietary format. .aupreset files nonetheless do save the complete state of the instrument at the given time, so it is your choice as to which to use. In this kind of situation I generally recommend using the instrument’s own menus. If any plug-ins were installed for the current user only, they’ll be found here, but since this will not usually be the case, you’ll probably find these folders to be empty. That about wraps it up from me, for now, on understanding Logic’s installation paths! Those are all Windows files so none are suitable for Mac-based Logic Pro. You need to look for “Audio Unit” based plugins. Each should have an installer which will place the plugin in the correct directory. I’m trying to load a Logic Pro factory default Space Designer preset from my old laptop into Logic X on my new laptop. How do I do this? When I look into the Plug-In Settings folder it looks empty. Are pst files hidden by default? i found that really useful. Found out where my User Audio Folder is. Please note that when in Logic under Settings -> Assets you’ve checked the corresponding boxes Logic will move samples you use in a new sampler instrument to the project folder and it will put you in the in the project folder when you’re saving your instrument. You could navigate to your user library, but be warned that the instrument will be referencing the samples in the project folder! So, contrary to how I’ve been working in the past, I’d advice you to NOT move assets to the project folder, unless you decide to move the project folder. In that case, first open the project, check where you want your files to go and then move the project folder. Hi there! What folder are the actual plugins program files kept in? eg, EXS24 itself, or any others? I’m trying to see if it’s possible to re-program or edit the files to be used with another DAW, like Cubase or DP. Perhaps my efforts are useless, but I’d really like to give it a shot. I have just purchased a Drum Sample and Loop Pack http://xclusive-audio.com/product/drum-bundle-trio/ which contains Drum Kits and loops and Wav, Aiff and Mxgrp files and I wanted to know where I should put these files to install them for the right instruments? For example the Loops where should I place the loops to install them in the loops browser. Note there are over 200 loops. And where should I put the other Drum files the Wavs and the Mxgrp which appear to be a part of the many different Drum Kits I have to install? And by places the files in the right folders and locations does this mean that they will install properly and be available to use within Logic Pro X? Sorry I am posting this again as I forgot to add the notify me of follow up comments by email check box. I installed logic and downloaded all contents, now I am creating a new user and in it i am requested to download again all contents, is there some file that can copy and paste from home for first user to the second? You're the 1,050,294th visitor so far!